Dock Robinson Summey, son of Lintford Samuel Summey and Artilda (Tilda) Anne Tidwell, husband of Dollie Shepherd and Luella Crowe Hite. Dock Robinson Summey, 29 Young Street, died Friday night following a brief illness. 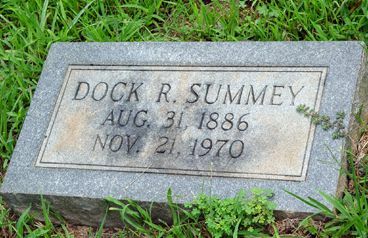 He is survived by his wife, the former Miss Dollie Shepherd, five daughters, Mrs. Annie Jackson, Smithville, Georgia; Mrs. Fannie Mae Crisp, Mrs. Susie Abernathy, Mrs. Sally Bell Darnell, Mrs. Louella Weaver, all of Acworth; four son, L.J. 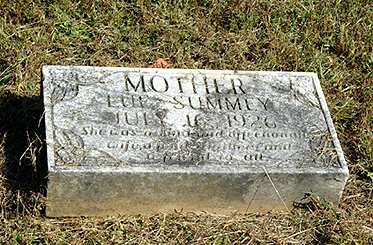 Summey, Elihu Summey and L.C. Summery, all of Cartersville; and Lewis Summey, Acworth; four step-daughters, Mrs. Ed Russell, Mrs. Gus Stone, Mrs. Walt Akins, and Mrs. Velma Pruitt, all of Cartersville; four step-sons, Jeff Crowe, Coleman Crowe and Lewis Crowe, all of Cartersville; and Elmer Crowe, Marietta. Funeral services were held at 2 p.m. Sunday from the Corinth Baptist Church with the Rev. George Chastain and the Rev. Raymond Brown officiating. Interment was in the Old Macedonia Cemetery. Mrs. D.R. Summey, 41 years old, died at the family home near Cartersville last Friday afternoon at five o’clock after a lingering illness. Funeral services were held on Saturday morning at 11 o’clock at the residence, and were conducted by Rev. Sandy Bennett. Interment followed in the nearby family graveyard. Surviving are the husband, six daughters, Mrs. Allen Jackson, Misses Fannie, Susie, Ellen, Sallie and Pearl Summey, and three sons, Messrs. Lonnie, Lewis and L.C. Summey. The very sad funeral of Mrs. D.R. Summey was held at Macedonia last Saturday. A very large concourse of friends gathered to pay their last tribute of love and respect to the deceased. We extend our heartfelt sympathy to the bereaved husband and children. NOTES: Her husband is Dock Robinson Summey. Her death certificate lists her parents as Ed Crowe and ______ Hite.